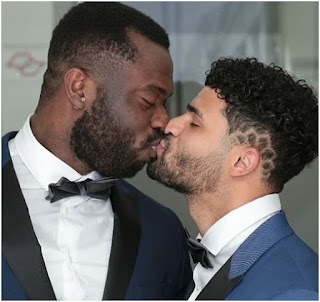 Home / Entertainment News, Media News / Nigerian GAY writer weds his Brazilian sweetheart, Here are PHOTOs from the wedding. Nigerian GAY writer weds his Brazilian sweetheart, Here are PHOTOs from the wedding. Wednesday, August 23, 2018 - Famous Nigerian gay writer, Michael Lord Smith, is the discussion on social media after he married his Brazilian gay lover, Deck Farias, in Sao Paolo. “Finally the appointed day has come. Thanks to everyone who made this special day possible.